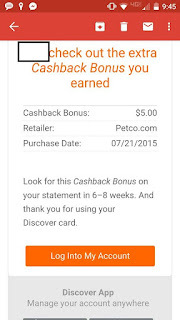 One of the new American Express Offers for You is for Petco. The offer is $15 off a $50 purchase and expires on 8/30/2015. 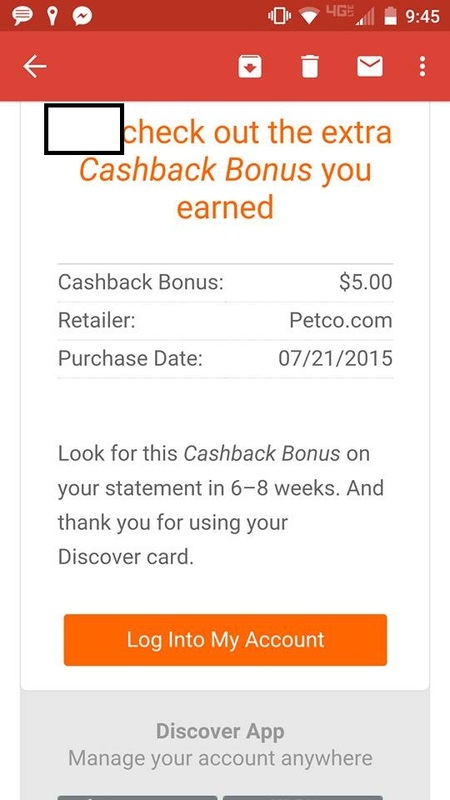 First of all, if you don't have a Petco account, I would appreciate it if you signed up with my referral link. We will both earn $10 off a purchase at Petco. It won't work on gift cards (that would be nice!). There isn't too much money to be had, but let's work this through as some might be interested for the points or hitting a minimum spending threshold and for the possible extra money maker at the end. $50 physical gift cards will trigger the congratulatory email from American Express for using a synced offer. eGift cards have such a poor resale value and you wouldn't want to buy them anyways. Currently, $50 physical gift cards can be sold to ABCGift Cards for 64%. You can also sell them to CardKangaroo for 65%. I've never had any experience with them so I can't say either way whether to use them. If you sell them for 64%, you will lose $3. Don't worry, it gets a little better. The next thing to check is whether shopping portals payout for buying gift cards. Frequent Miler Lab tells us that you will receive cashback from Top Cashback for buying a gift card. I can confirm that personally earlier this week. According to Cashback Monitor, Top Cashback has a very respectable payout of 8%. Top Cashback tracked within one hour and 10 minutes of my purchase. 8% of $50 purchase is $4 so you now have made $1 before credit card points. Not terribly exciting, but some might be interested if they really want the points or to him a minimum spending threshold. The transaction notification typically comes about an hour after your purchase so you find out quickly. I wouldn't personally do it if this is the only benefit, but it gets better. If you look at Cashback Monitor again, you'll see that the highest rate is actually Discover Deals at a whopping 10% or $1 extra. $1 is not much, but if the $5 turns into $10 in 13 months if you are enrolled in the Discover Doubling promotion, this is already something to think about. A test purchase was made on 7/21/2015, the same day as Top Cashback and the confirmation took about 3 days for it to come which is a lot longer than one hour but it did come. That means you get $2 net now and another $5 later for a total of $7 profit per AmEx credit card. If you don't have a Discover card, please consider signing up from my referral link. We will each get $50 (after your first purchase) which will be doubled after 13 months. If you have the offer on multiple cards in the same online log in, before you add it to any one card, open a new window in your browser for each card. Activate them all at the same time. Otherwise the offer will disappear from the rest of your cards in the same online account. Gift card reselling prices are always in flux. When big deals like these come out, you should sell as soon as possible to minimize the chance that the price being offered for your gift card lowers because of other resellers. In this scenario, if a lot of people do this the price will almost certainly decrease quickly since this is a gift card that is not normally in high demand. Another possible problem is that the purchases may not track properly. You can ask for the money afterwards but that can take a long time to track. If however you use Discover Deals without using a Discover card, you will have no recourse from customer service if it doesn't track.